Alexandra has been joyfully teaching and directing Music Together® since 2002. She has also created her own drumming and dance classes for her families. 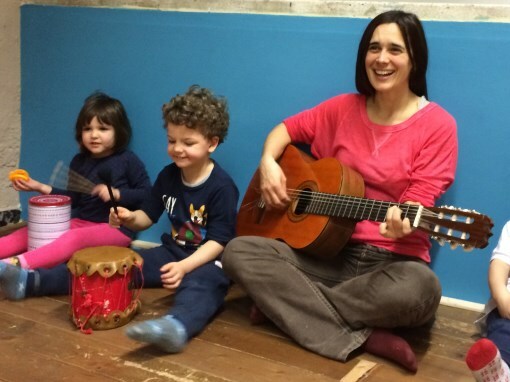 Alexandra has taught music in Paris, Brooklyn, at the "Piccola Scuola Italiana" and the JCC in SF. As a multi-instrumentalist she plays piano, guitar, saxophone, didgeridoo and djembe. Alexandra cares deeply about early childhood music education and is certified in Dalcroze, Orff, the Music Together Guitar program and has reached certification level two with Music Together. She has also studied harmony and choir at the "Duke Ellington School of Performing Arts High School" in Washington DC. Alexandra speaks and sings in Spanish, Italian and French. She says the greatest reward in life is sitting in class and having fun with the kids and parents! Mixed Ages (0-5 years). (Coming Soon) Tuesday 9:30 AM 06/18/19 8 weeks 08/13/19 Teacher Alexandra No class 7/2. Music Together® con Español (Coming Soon) Tuesday 10:30 AM 06/18/19 8 weeks 08/13/19 Teacher Alexandra No class 7/2. Music Together® con Español (Coming Soon) Tuesday 11:30 AM 06/18/19 8 weeks 08/13/19 Teacher Alexandra No class 7/2. Mixed Ages (0-5 years). (Coming Soon) Wednesday 9:30 AM 06/19/19 8 weeks 08/14/19 Teacher Alexandra No class 7/3. Mixed Ages (0-5 years). (Coming Soon) Wednesday 10:30 AM 06/19/19 8 weeks 08/14/19 Teacher Alexandra No class 7/3. Babies classes - (newborn to 12 months) (Coming Soon) Wednesday 11:30 AM 06/19/19 8 weeks 08/14/19 Teacher Alexandra No class 7/3.